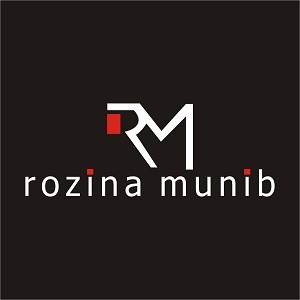 M/s Rozina Munib (RM) was founded in the year 2003 by a creative designer; Rozina with the simple motto to "Think different"
Rozina is a versatile designer with indisputable flair for fashion. She can glide between enchanting glorious formal wear and smart contemporary Pret wear with equal ease. She has a great eye for color assembling and playing with contemporary and classic drapes making her design uniquely elegant and heart-touching. Her detailing is refined and creative. She relies on her sense of creativity and use of color to create ensembles that are wearable at various occasions. RM style is all about standing out with bright motifs and designer decals. Her signature style is opulent with meticulous detailing with large variety of fabrics, silhouettes, colors and embroideries. RM's niche lies in the embroideries on Chiffon in a combination of meticulous detailing's and an impeccable sense of colors to bring the essence of a Woman. Indian Chicken Kari and Gara work inspires most of RM's embroideries with a touch of handcrafted embellishments. Now the label has developed a unique style of own reflecting the Latest traditions of Pakistani craftsmanship in a contemporary vocabulary. Their designs are created with innovative use of tradition and modern styles. Apart from the formals in chiffon embroideries, the brand also offers designs to capture the segment that desires Western influenced aesthetics and cuts. RM's collection is available online at their webstore: www.rozinamunib.com including all leading multi-label stores like Runway Eleven Karachi, Ensemble Karachi, Ensemble Lahore, Ensemble Islamabad, RM own flagship store in Dubai UAE and with some stockiest in UK, USA, India and South Africa.